2010 Brewer-Clifton Chardonnay Mount Carmel: Retail $30. The last bottle I had of this was underwhelming: very good, certainly, but not much more. This was a different story, however. Great fruit and acidity. Wonderfully balanced. Round but sharp. Creamy yet citrus. A great combination of contrasts. Outstanding. 91-93 Points. 2004 DuMOL Syrah Russian River Valley: Retail $60. Wine of the night? A nose that I could sniff for a while–blueberry pie anyone? Virtually seamless on the palate with near impeccable balance, this is incredible. My only complaint? That we had finished the Ojai and could not compare the two. Worthy of several Whoas as well. Outstanding plus. 94-96 Points. 1996 Duval-Leroy Champagne Brut Millésimé: Retail $65. Not even a sigh upon opening, but plenty of bubble on the pour. Certainly an older Champers but in my wheelhouse–fruit (other than some citrus) a memory, with a subtle Sherry note. Lingering finish. Not for everyone, but certainly for me. Outstanding. 91-93 Points. 2003 Domaine de Fontavin Châteauneuf-du-Pape: Retail $50. Brett. Lots of Brett. Behind the Brett? Some solid fruit and a great mouthfeel. Great fruit still, but the Brett is overwhelming. Even for me. If there were no Brett? This would be a solid Whoa, but… Unrated. I am not quite ready to label all Brett as a “flaw” but when there is this much of it? That can not be the way the winery wanted this wine to taste. 1997 Paul Jaboulet Aîné Cornas Domaine de Saint Pierre: Retail $65? Whoa. The color–dark and slightly brooding, with no real signs of age. Interesting nose of plum and stewed raspberry. On the palate rich and smooth with balance and verve. Whoa. Bigger than I thought it would be, but whoa. Outstanding plus. 92-94 Points. 2014 Château Miraval Côtes de Provence Rosé: Retail $25. Alright. I know. Brangelina and all that. I know. I really wanted to hate it. Really. But I can’t. Because it is good. Really good. Fruit, acidity, depth. Corny bottle, celebrity backdrop, but good wine. Wish I could hate it, but I can’t. Neither should you. Outstanding. 89-91 Points. 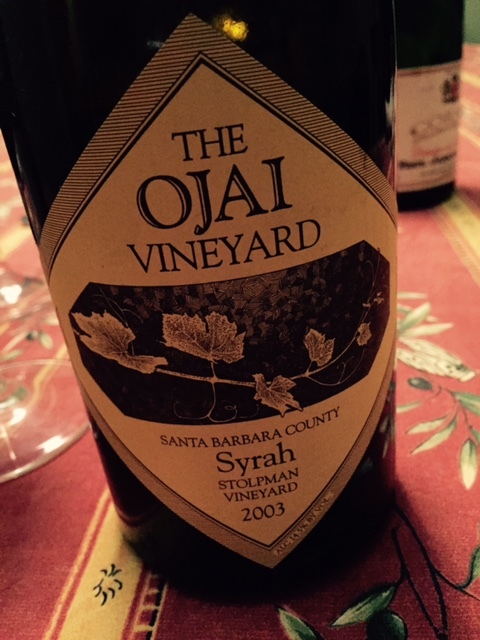 2003 Ojai Syrah Stolpman Vineyard: Retail $55. Whoa. Whoa. The nose was a bit nondescript but there was certainly some dark berry fruit. On the palate rich fruit. That gets a whoa. Depth all the way through. Another Whoa. Finish? Whoa. One of the best Syrahs I have had. Outstanding plus. 94-96 Points. 2009 Roessler Pinot Noir La Brisa: Retail $25. I have only limited experience with Roessler, but I have been always happy with their wines. I got this wine from Wines Till Sold Out and was a little surprised since the label makes it seem like it is a second wine. When I went online to see what the heck the story was, I realized that Roessler was bought out by Kathryn Hall (and now will be called “WALT” wines–yes, all caps). I guess I should try and stay on top of what goes on a little better. The wine? Not bad, even very good–good fruit and a bit of depth, but not one for keeping around–drink up! Very Good. 87-89 Points. WINE OF THE WEEK: I seem to say this just about every week, but choosing a Wine of the Week this time around was a challenge. Perhaps the obvious choice, given my predilections, would be the ’96 Duval-Leroy, but for some unplanned reason, I went through a bunch of Syrah this week, and it seems only fitting that the wine of the week be one of those. The ’97 Jaboulet Cornas was sublime and time is running out on the older French wines I have in my cellar–I bought a bunch a while ago, but as the price for good French wines continued to climb, I stopped buying. Then there were the two California Syrahs, which we consumed on the same night as the Cornas. The DuMOL was stellar and at the time, I considered it the wine of the night, but I never have really understood their choice of capital lettering in the name of the wine (and you know how I can be a bit of a stickler with grammar), so that makes the 2003 Ojai Syrah Stolpman Vineyard the Wine of the Week. Truly a magnificent wine, and drinking so well right now, but still has time left, in my opinion. This entry was posted in Cabernet Sauvignon, Champagne, Chardonnay, Syrah, Wine and tagged Chardonnay, Syrah. Bookmark the permalink. Ojai produces such high quality wine and Stolpman grows excellent Syrah; a perfect combination for a winning wine! I love following all of you fabulous wine guys. 🙂 I continue to learn so much. Brett? I just read all about it, thanks to you noting it on the Chateauneuf du Pape. Thanks for the great post.